Whereas many GIS or ecosystem modeling software packages present a confusing array of user inputs and options, ShellGIS offers a series of tailored interfaces to suit different Users. 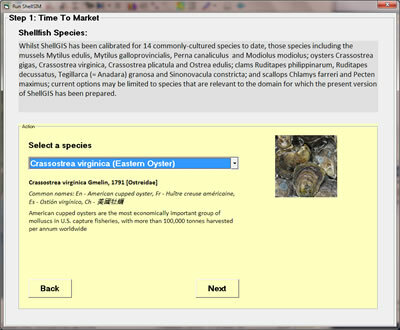 A ShellGIS Expert Interface allows the User to import their own and choose from different data sets describing the main environmental drivers of shellfish growth, such as include temperature, food availability, salinity, dissolved oxygen and aerial exposure. The User is also afforded an option that helps resolve which measures of food availability are required in the system of interest. For example, chlorophyll a alone may be a sufficient proxy for all organics in some waters, but additional measures of total particulate matter may also be needed to derive additional detrital organics where present in significant quantity at other locations (Hawkins et al., 2013 b). 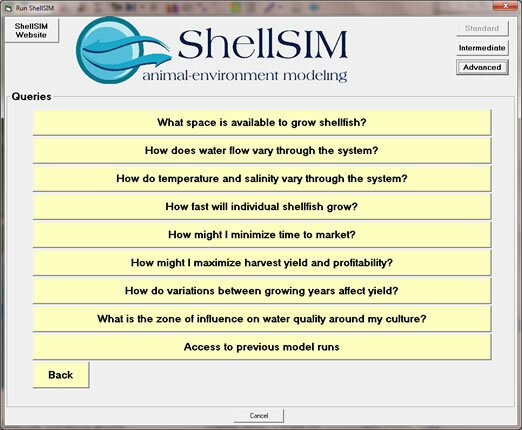 A ShellGIS Advanced Interface does not allow any loading or choice of data sets describing the main environmental drivers of shellfish growth. Instead, ShellGIS may only be run with a single representative set of environmental data that has been pre-loaded by the ShellGIS team. At the simplest level, the Standard Interface offers a selection of “what-if” scenarios to run on the modeled domain. Drawing upon a series of stakeholder meetings, those questions address practical issues that are important to aquaculture growers and managers. What space is available to grow shellfish? How fast will individual shellfish grow? How might one minimize time to market? How might one maximize harvest yield and profitability? How does water flow vary through the system? How does temperature vary through the system? How does salinity vary through the system? How do variations between growing years affect yield? What is the zone of influence on water quality around my culture? 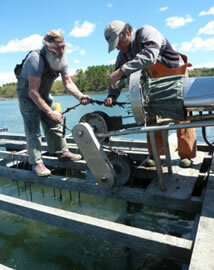 Where is the best place to grow shellfish in a particular bay or region? What is the effect of time of seeding, seed size and seed density? What is the growth rate of the selected species? What are the results in weight, length or profit? What is the difference between tray or bottom culture at a given site? What is the difference between a warm year and a cold year? What is the difference between a wet and a dry year? Is it more profitable to grow more smaller oysters or fewer larger ones at a given site? What are the effects of time of year of seeding on time to market size at different farm sites? What spatial information is available such as for pollution closures, existing lease sites, mooring fields, critical habitats and other constraints that may influence sites available for culture? What species would you like to work with (choice of 14 commonly-cultured species)? Do you want to model bottom culture or suspended culture (each in standard deployments of 1 hectare)? Where in the system do you wish to model shellfish culture (choice of single location, selected area or whole system)? How many days ShellGIS should run for (Start or Seeding Day and Period to Run)? What is the size of shellfish seed (entered as total live weight or shell length)? What is the seeding density (per m2 on the bottom or per suspended bag)? For suspended culture, how many bags are being suspended per cage? What is the harvestable size for chosen species (entered as total live weight or shell length; for each of small, medium and large sub-options)? What mortality do you expect between seeding and harvest (fraction of number seeded)? Monthly cost of maintenance per seed? Cost of harvesting each individual shellfish? Market value of each harvested shellfish (for each of small, medium and large sub-options)? To assess possible variations between growing years, how much would you like to vary temperature and/or salinity (each in units up to ± 5)?